In the category of "hidden gem" or "best kept secret," the National Museum of Commercial Aviation is right here in Atlanta's own backyard. Their headquarters and research archives is currently housed in a temporary space, but in the next couple of years they will open the doors of a beautiful, multi-level, hangar-inspired museum. That's the current plan, pending necessary fund-raising. As with most museums, only about 10 percent of their artifacts is on display at this time. That collection, which includes everything from retired planes to toy planes, is becoming more and more impressive as the grand opening of the new facility nears. Among the collections is a fun and funky smattering of commercial aviation uniforms. 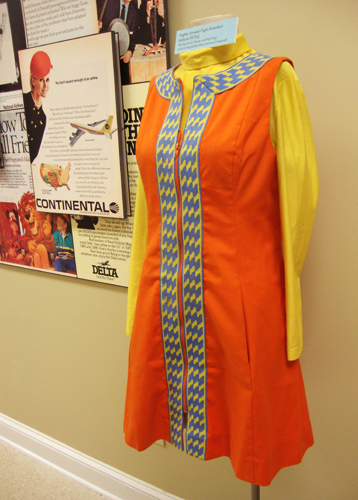 This particular uniform (photo), obviously from the 1970s, is a Hughes Airwest flight attendant uniform. It was designed by Mario Armond Zamparelli, Chief Executive Designer for Howard Hughes' conglomerate. I can hardly wait for the new museum to take flight!